Work can be a place where healthy habits fly out the window. Despite the daunting task of making time to take care of yourself, you’ll find yourself happier and more productive if you do. 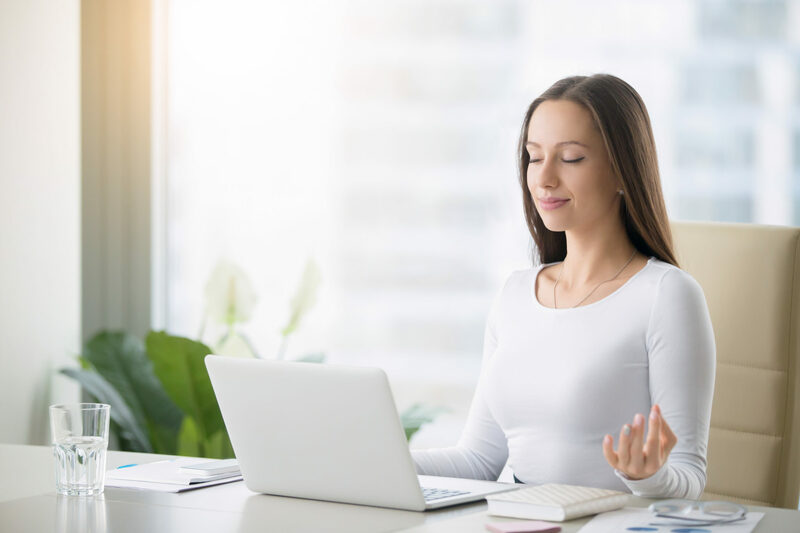 Making small changes to your workday can make a big difference when it comes to your mental, physical and emotional health. To mark National Workplace Wellbeing Day 2018 we have seven simple steps that you can follow to improve how well you work. 1. Don’t just sit there! This is one of the biggest issues when being desk bound everyday. 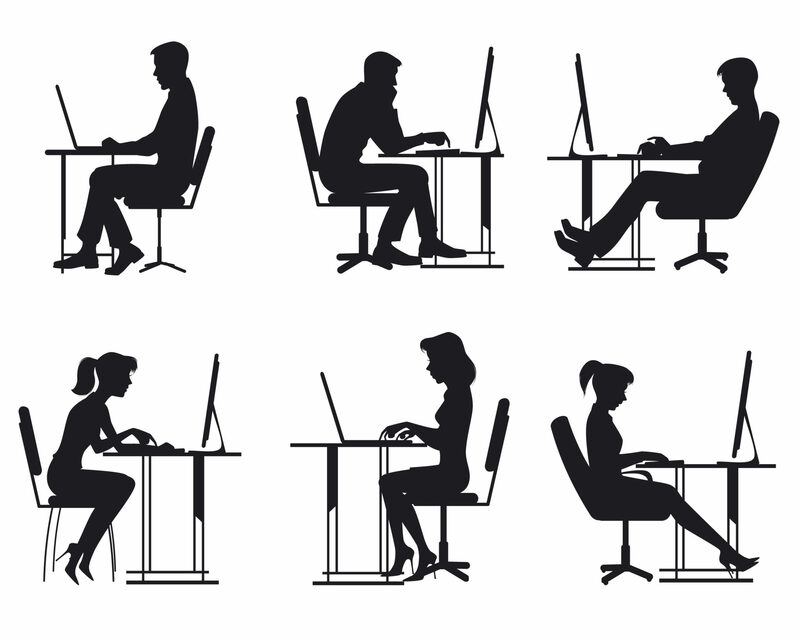 When you sit in a chair, the chair does most of the work for you and therefore your posture becomes lazy and slouched. It is important to engage your core, pull back your shoulders and keep your back straight. If you are struggling stand whenever you get the opportunity, even if it’s just for phone calls, it will make a big difference. Did you know that standing for one hour can burn up to 50 calories? So next time that phone rings stand up to answer it! The reality is we all spend a lot of time at our desks and the healthier you can make that space, the better chance you have of getting and staying healthy. 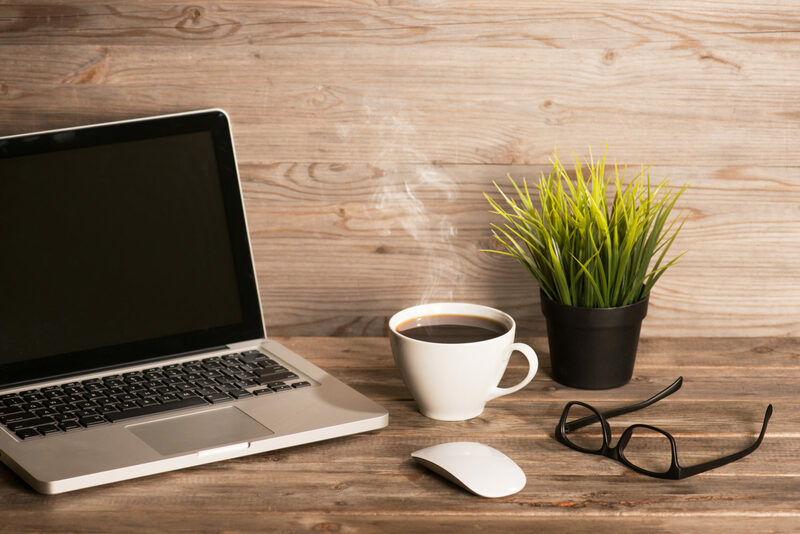 Get rid of the clutter – oftentimes if your desk is sloppy, your work will be too. We all tend to be rushing out the door in the morning but skipping breakfast can leave you feeling peckish and reaching for sugary foods and drinks throughout the day for a boost of energy. 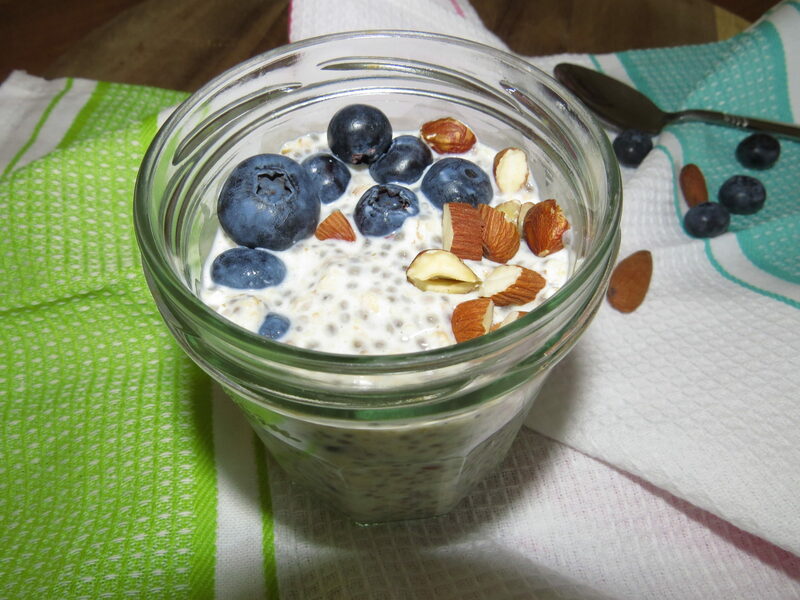 We suggest making Chia Overnight Oats – they are quick to prep the night before and are the perfect on-the-go breakfast packed full of nutrients. Chia seed is high is Omega 3 and fibre to keep you feeling fuller for longer too – win, win! It’s the top of everyone’s new years resolution list- ‘drink more water’, but how many of us actually do? Dehydration can lead to low-mood, fatigue and lack of focus and who wants that with an ever growing to-do list? 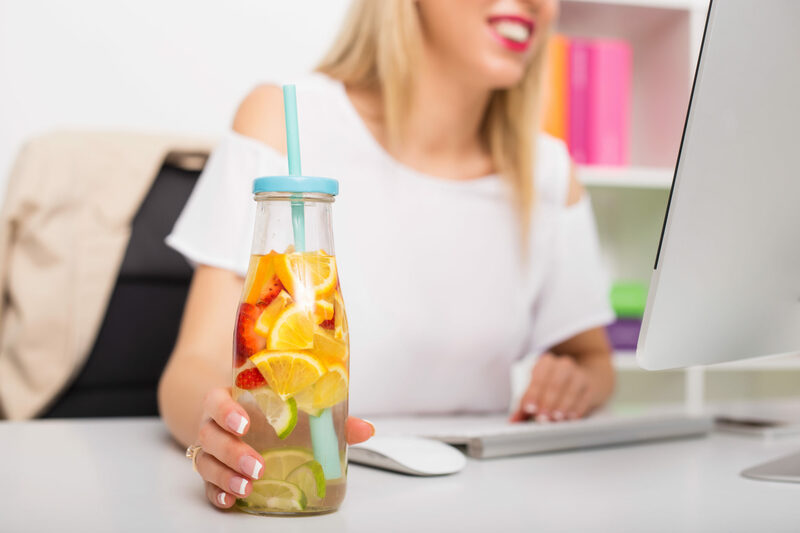 Keep a bottle of water on your desk to sip on throughout the day. You can make your water more interesting too by adding fruit and this will give your water a kick of flavour. Another bonus from that extra water intake is the extra trips to the bathroom, all of these mini breaks from your desk allow you to recharge and go back to being productive in the office. We all have jam-packed schedules nowadays and we can feel like we can’t take even the smallest of breaks because “we have so much to do”. In reality this makes us less productive so taking quick breaks is important. Try to work in blocks of time and take a quick break at the end of each block (these could be 30-45min blocks). Set a timer if you must, but at the end of each block get up, stretch your legs and take a break. Taking this break will allow you to refocus and get ready to tackle your next task. Our mental health is so crucial to our overall wellbeing. Taking time to meditate and quiet the mind is so important. Meditation has many benefits including increasing your ability to stay calm, focused and non-reactive. You can simply close your eyes and repeat a mantra or intention in your head or just enjoy a moment of silence and listen to your body. If you can find a quiet spot for this great but if not just stick in your headphone and shut your eyes for a couple of minutes at the desk. There are great meditation apps, such as ‘Calm’, which can really help you to get into a relaxed state. Having fun is key in creating a healthy and happy work environment. It can’t be all work and no play so organising a weekly or monthly get-together is a great way to boost morale and simply have some fun. Here at Chia Bia HQ we love having get-together’s in our canteen and most Thursdays we take twenty minutes out to play quick-fire rounds of ’30 Seconds’. This is always good fun and it gets the brain working too. Great product, great service and very helpful staff. Thoroughly recommended.